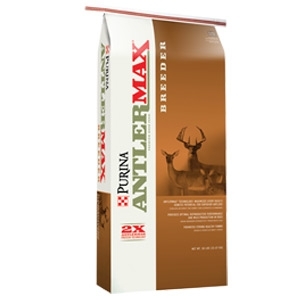 Purina Mills AntlerMax Breeder Textured 17-6 | Florida Farm & Feed, Inc.
A complete, nutrition-packed, 16%-protein, pelleted ration designed to be fed as a complete feed to deer and elk in confinement. It is also suitable to be used as a creep feed and weaning ration for elk calves and deer fawns. Click here for guaranteed analysis and more information on this and other products. The protein content supports top performance with patented AntlerMax® Technology to promote superior antler growth, reproductive success, abundant milk production and supports optimum growth and healthy development in young. We are constantly adding new specials to our site. Be sure to check back often! © 2019 Florida Farm & Feed, Inc.. All rights reserved.